"Since your objective is to achieve enlightenment, you have to look far ahead, just as when you’re traveling to somewhere very distant, you have to generate a strong determination to go there. You have to look far ahead and generate a vast mind. The third advice is don’t squeeze yourself. Don’t allow yourself to become stressed out, thinking, "Oh, I have to do all this!" With a vast, brave mind, think, “I’m going to do all this. Even if it takes many, many years, I’m going to do it.” When you do follow the advice “don’t squeeze yourself,” your mind naturally relaxes. Your mind is not stressed, not uptight, which causes lung, or wind disease. "You should have a vast mind, planning to study and learn everything about the whole path to enlightenment, as well as to practice it and actualize all the realizations. While you have that plan, you also have a relaxed mind; you don’t stress yourself. You think, “No matter how long it takes, I’m going to do it. I’m not going to give up.” You have the plan inside your heart, but at the same time your mind is calm and relaxed. "These are essential pieces of advice from the Kadampa geshes about how to go about achieving enlightenment. And if you follow these instructions you will definitely achieve enlightenment, even though you might think it’s impossible. 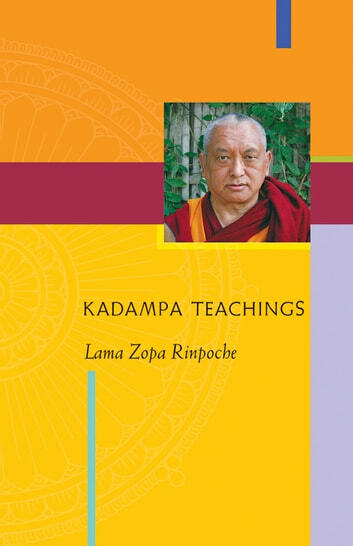 With a long-term plan to learn and to practice Dharma, your mind can completely change, and you can achieve realizations."